This was our second stay at Church Mews Cottage and was as enjoyable as the first. It’s central location and impressive outlook are why we return. This property is ideally located as a base for exploring the area. It has everything you need for your stay. We had a lovely 4 day stay at the cottage over New Year 2018.
are all welcoming and within close distance to the cottage.A special mention to Number 9 tapas restaurant which was our favourite with fab service. We enjoyed our time at the cottage. The location was fantastic. Cottage was comfortable and homely. Kirkby Lonsdale is a lovely accommodating town, very dog friendly. We had a wonderful holiday in the beautiful village of Kirkby Lonsdale. The cottage was welcoming and had everything we needed for a comfortable stay. The cottage was warm and welcoming after a day exploring and the local pubs shops and restaurants were fantastic. The Sun Inn just mere steps away from the door. The communication every step of the way was excellent including a safe journey home text. W lived and and will be back. What an ideal location, great for walks and nipping literally around the corner into the little quaint Kirkby Lonsdale - fabulous pubs, restaurants and independent shops - great!! Cottage has everything you could need - lovely touch of wine, fresh bread, milk and homemade jam - delicious!! Thank you for a great stay, we will be back!! Booking through Mill House Cottages, we decided to go with Church Mews, the smaller cottage, based on it’s location...it was the perfect choice for two adults and a dog. Being central to Kirkby Lonsdale was ideal, with the nearest pub, The Sun Inn (dog friendly), a stones throw. Easy access to everything we wanted the location was great being able to walk through KL to get to Devils Bridge and across the Chuch grounds to see Ruskins View. The cottage itself is like a little tardis compared to what you see from the front. Thankfully I’d already read the reviews about the small bathroom so it was our choice to go with it, but it really wasn’t a problem, however I would have been a little disappointed had my expectations been based on the website photos! The cottage was really cosy and had everything we wanted. We thoroughly enjoyed our stay at Church Mews and would certainly recommend it. The cottage was very peaceful with lovely views over the churchyard. Comfortable seating in the sitting room and a well fitted kitchen. Comfortable beds though the bathroom was a bit tight on space but it wouldn't stop us from staying again. All in all we were very happy with the property. We have stayed at Church Mews, Mill House Cottages for short breaks away over the past 3 years and each time we have found the accommodation to be excellent and in a prime location for walks in the dales, shopping on Main Street in Kirkby Lonsdale and pleasant meals out in the lovely bars/restaurants. We will most certainly be returning. Me and my husband were desperate for a peaceful, cosy retreat from city life, and Church Mews Cottage certainly delivered this. Service from the owners was great, allowing us to check in earlier so we weren't hanging around. The cottage itself is situated on a quiet lane, adjacent to the church, which rang its bells throughout our stay. We so miss that sound! The cottage was cosy and clean, and most importantly in the wet weather, warm! Unique touches like the welcome pack waiting for us, and beautiful toiletries, made the perfect addition to our stay. We planned multiple days out whilst staying at the cottage, but due to poor weather were forced to cancel. This did not matter as we were able to enjoy our days spent in the cottage, with the log burner roaring and a good book! We would recommend the cottage to anyone, and have already done so to many family and friends. We cannot wait to go back. We loved our week in Church Mews Cottage. The welcome hamper and ready made fire were much appreciated. Thank you very much! Lovely cottage , in the right spot, tastefully decorated, bathroom not easy to negotiate but a lot of fun, would definetly book again. My husband and I absolutely loved our stay at Church Mews cottage. Its a delightful cottage in the most perfect location. Everything in Kirkby Lonsdale is a short walk away (shops/restaurants/pubs). The town itself has so much charm and its easy to fall under its spell. Just walk through the church opposite and you come to Ruskins View and a little further along Devils Bridge. Its a good base for exploring the South lakes too. The only negative for us was the incredibly small wet room style bathroom/toilet. Its slightly claustrophobic and awkward. That being said it would not deter us from a return visit. We had an enjoyable stay here, having stayed in the area several times before. It's well situated and has some very scenic walks and beautiful views even within the town, case in point being Ruskin's View, which is probably about 100 metres away from the cottage. It's a good launch pad for either the Yorkshire Dales, the Lake District, not forgetting Westmoreland itself, which has plenty of charm. We keep coming back to this area, which pretty much speaks for itself. We had a wonderful week in Church Mews Cottage Kirkby Lonsdale. The cottage is situated central to the town, with access to many wonderful shops, restaurants and bars. Wonderful local walks, and fabulous views take you along the river straight from the front door. 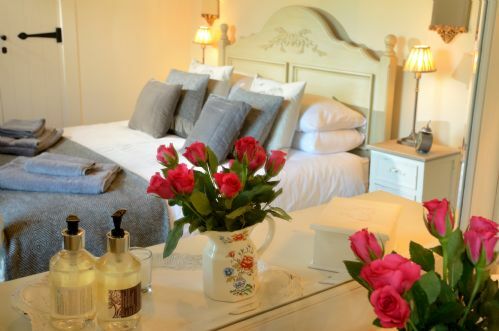 The cottage is warm, cosy and extremely comfortable giving you everything you need for a relaxing week. Although there is no parking at the property, you will always find a space not too far away. From the moment we arrived until the day we left our experience was sensational and everything we hoped it would be. A perfect mixture of relaxation and enjoyable times. We enjoyed our stay in the beautiful Church Mews Cottage. The location is really great and very quiet. Kirkby Lonsdale is a very nice little town with good restaurants and pubs just around the corner of the cottage. The only thing was the bed. The matress was a bit too soft for the two of us. Thorough enjoyable stay at the cottage. It was cosy and comfortable, excellent location and the directions provided were spot on. I'd definitely consider a return trip. Fantastic and picturesque accommodation, beautiful and incredibly comfortable for all the family. Would highly recommend! Great little cottage, great location, perfect for bars and restaurants. Dog friendly which is great, will definitely be back. We had a lovely stay in Church House Mews over Christmas. The cottage was cosy, with a log burning fire, it was all beautifully decorated and in a fantastic location. The kitchen had everything you needed for a short stay and although the bathroom was tiny, they've made the most of the space available. My only suggestion would be to get new mattresses for the beds as they were very soft but that could be a personal thing. I would highly recommend this as a holiday let - the views of the churchyard are stunning and you are minutes away from bars, restaurants, a supermarket and beautiful walks around Kirkby Lonsdale and the letting company were a pleasure to deal with and very helpful with any queries we had. Even though we didn't get the best weather ,we thoroughly enjoyed our stay at Church Mews. Cute cottage with the most wonderful view of the churchyard,and Kirkby Lonsdale is full of delightful shops and wonderful places to eat. All in all highly recommended. A delightfully cosy cottage in a quiet spot overlooking a historic church and surrounding parkland. It's located in a stunningly picturesque town, accessible within seconds, and designers had made excellent use of limited space in some areas to install user-friendly kitchen appliances, a wood-burning fire and a hugely appreciated power shower. We found it extremely well equipped & impeccably clean and afforded us an ideal base for visiting both the Dales and the Lake District, although we could so easily have spent the entire stay in and around the cottage, exploring the Lune Valley and going on myriad walks that pass, among other landmarks, Ruskin's famous view and the Devil's Bridge. We hope to return before long. We decided to stay at Church Mews as it was nicely positioned between Yorkshire and the Lake District so would allow us to explore either area. We also liked the option of being in a town so that we could walk our for a meal/drink without having to take the car. Church Mews did not disappoint! Kirby Lonsdale itself is a lovely town with a nice mix of shops, cafes, restaurants and bars has some beautiful features (views, river, architecture) and the surrounding area was gorgeous. The cottage had everything we needed and gave us a perfect base from which to explore. There were plenty of lovely places to eat out and the local shops/supermarket meant it was also easy to eat in. Great place to stay. Would happily return for another visit.